Please refer to our stock # TD1013 when inquiring. 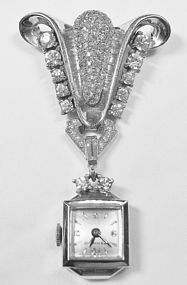 This is a rare item - a Pennino sterling clear rhinestone studded lady's lapel watch. As with all lapel watches, the watch appears upside down when looking from the front. That was to allow the person wearing it to tilt it up and be able to see the time. The watch is a 17 jewel Swiss movement, and it needs to be cleaned and oiled, but it runs. The entire pin including the watch dangle is 2 1/4" long by 1 1/2" wide. It is an exquisite piece made by a company known for quality. It is in excellent condition and is marked Pennino on the watch face, as well as on the back of the pin, as shown.